From left, Supreme Court Justices Ruth Bader Ginsburg and Anthony Kennedy, and Chief Justice John Roberts attend a private ceremony in the Great Hall of the Supreme Court in Washington for late Justice Antonin Scalia, Feb. 19, 2016. U.S. Chief Justice John Roberts on Monday remembered Justice Antonin Scalia as a friend and colleague of "irrepressible spirit" as the Supreme Court returned to the bench for the first time since Scalia's death. "He was our man for all seasons and we shall miss him beyond measure," Roberts said in brief remarks. Roberts described Scalia's humble upbringing in New Jersey, along with his top performance at Georgetown University and then at Harvard Law School, where he met his wife, Maureen. As a top attorney at the Justice Department, Roberts said Scalia argued his first and only case before the Supreme Court in 1976. "He prevailed, establishing a perfect record before the court,'' Roberts said to laughter. Scalia became the 103rd justice confirmed to the high court in 1986, Roberts said, and wrote 292 majority opinions. 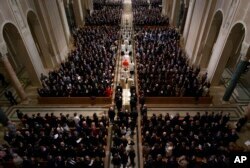 FILE - The procession for the funeral mass for the late Supreme Court Associate Justice Antonin Scalia at the Basilica of the National Shrine of the Immaculate Conception in Washington, Feb. 20, 2016. "He was also known on occasion to dissent,'' Roberts said to more laughter. The staunchly conservative Scalia was widely known for his colorful and witty dissents, often finding himself representing the minority opinion among the court's nine justices. On Saturday, thousands of dignitaries, friends and family mourned Scalia at a funeral Mass in Washington. Scalia died February 13 at a Texas hunting resort. Scalia's death leaves the court with four liberals and four conservatives and sets up a fight between President Barack Obama and Senate Republicans. The Democratic president has said he intends to nominate a candidate, but the Senate Republicans have said they will block anyone the president nominates, saying the choice should be left to the next president, who takes office in January 2017.